We are a credible Exporter and Supplier of VPL Programmer (GPROG-16X). 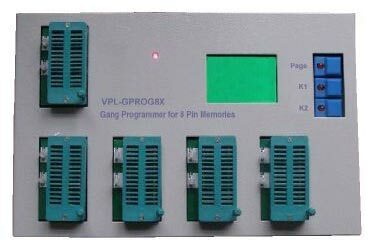 VPL Programmer (GPROG-16X) is a most powerful and versatile Gang copier efficient to copy any of the Serial EEPROMS of 24 & 93 series. It is a best product recommended for mass production of PC Monitor, Television, EPABX, etc. Best suited for mass production of TV, PC Monitor, EPABX etc. 4 keys to perform Program, Verify, Blank Check, Checksum & Select. GPROG-16X can do maximum of 8 SMD IC's at a time. Can be Software Upgrade : add greatly facilitate the future use of the device libraries the problems encountered. Most recent 25 series include A25L80P, EON25T80, F25L008A, W25X80 to name just few of them.